Back in the day it wasn’t a big deal to force fate with a pre-Iron Bowl rolling of Toomer’s. The “I’d rather plow bit” is a reference to Bear Bryant’s claim that if he couldn’t beat Auburn in 1979, he’d rather go back home and plow. The poisoning of the Toomer’s Oaks has given us an urgent excuse to trace the tradition of rolling Toomer’s Corner back to its real that-makes-sense roots. Because these days, when it comes to explaining this “uniquely Auburn” tradition, the university’s left hand typically doesn’t know what its right hand is tweeting. Camp War Eagle counselors spin a story about the rollings being a modern interpretation of an ancient custom of hanging telegrams containing the scores of away games on the Toomer’s Oaks (which hadn’t even been planted yet) as a way to broadcast football victories to the townsfolk. After saying “Nobody quite remembers when it began,” a video about rolling Toomer’s Corner uploaded last week to Auburn Athletics’ YouTube account says “…but around 1962 a roll of toilet tissue was thrown over the nearest tree to celebrate the latest Auburn Tigers win.” Where that date came from is anyone’s guess, but its the latest, vividly imagined (“It was quickly followed by many more rolls until the trees, buildings and everything in sight were festooned like a winter’s blizzard”) theory that presupposes the tradition began with a sort of roll heard round the Auburn world that was immediately perceived as such. However, there is that whole thing about how Toomer’s was once only rolled for away game victories. It wasn’t a rule—there were no rules. It’s just the way it was. Of course, you just kind of take for granted that they mean after away game victories. As in, not before Auburn won. As in, not before the game. As in, not the night before the game. Every Thursday before Auburn’s games, fans gathered in Graves Amphitheater for a huge pep rally. Clad in sorority and fraternity jerseys or bright Auburn t-shirts, enthusiastic fans yelled for victory. No pep rally was held before the Wake Forest game. Instead, fans were invited to a send-off for the team at Sewell Hall. Football players were given last minute encouragement as they left for Winston-Salem. Also there was a change in the place for the Finish Florida pep rally. It was held on a Friday night at Toomer’s Corner. This change stirred a big crowd and proved effective as Auburn trounced the Gators the next tday. 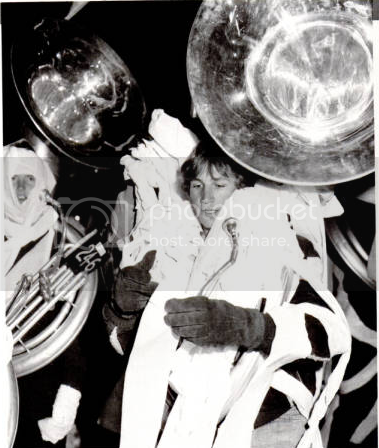 A tuba player rolled at a pre-game, ply-friendly pep rally in 1979. 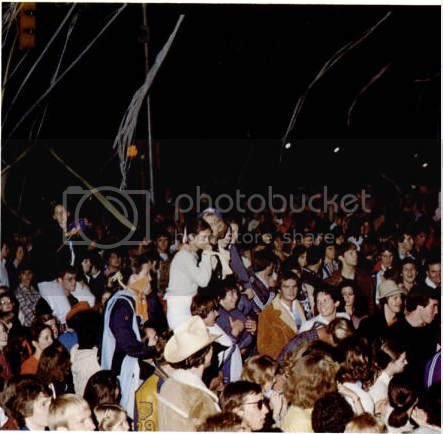 It’s even more evidence that once upon a time, and not so long ago, Rolling Toomer’s (TM) was just rolling Toomer’s, the spontaneous offspring of buck wild Auburn Spirit, group psychology, and toilet paper, not a symbolic renewal of an apocryphal ritual to honor victory’s ancestors. Because if it was, we were doing it wrong. Related: Hey Auburn fans, see you at the attractive intersection structure? / Rare COLOR photos of Toomer’s being rolled after Punt, Bama, Punt. Do you want TWER to keep on keepin’ on? Do you have five dollars? I was at AU from 1977-1981 and we only rolled after away victories. It wasn’t near the big deal that it is today. I remember this pep rally though. I was there and David Langner really fired us up. I think I remember him saying something about ” hatin’ them sonsabitches”.